I've read--I forget exactly where--that the ceratopsian parietal is the most diagnostic bone in the entire head or body. Indeed, after researching and restoring parietals and squamosals for this post, I would tend to agree. While we've seen that postorbital horns are of little phylogenetic significance, nasal horns are little better, and jugal horns are virtually worthless, the structure and decoration of the parietal bone tells us not only whether the animal is a chasmosaurine or centrosaurine (every time), it is also an excellent genus or species specifier. The ceratopsian neck frill is an incredibly useful, diagnostic feature. To avoid an overly-lengthy discussion, this post will focus only on the Ceratopsidae proper, though the frill structures of protoceratopsids and Zuniceratops are fascinating in their own rights. The former group in particular seems to have developed its own unique frill shape and design that's worthy of a separate post entirely. At any rate, all ceratopsid frills are built the same way: a hypertrophied, fused parietal bone connects to two large, plate or strap-like squamosals on either side. The shape of these bones determines the subfamily identity of the ceratopsid in question. In chasmosaurines, the parietal is long and hatchet-shaped--narrow at its proximal end, wider and curved at its distal end. The squamosals are elongate and knife-shaped, making up a large portion of the frill's outline. In centrosaurines, however, the parietal is much more circular, and the squamosals are shaped rather like a short machette, comprising little of the frill's total outline. A sampling of chasmosaurine neck-frills, showing the structure of the parietal and squamosal bones. From left to right and top to bottom, Chasmosaurus belli, Triceratops "serratus," Anchiceratops ornatus, and Pentaceratops sternbergii. Note that even in Triceratops, the structure of the squamosals confers to the normal chasmosaurine form. Chasmosaurines and centrosaurines appear to have approached frill decoration in subtley different ways. Centrosaurine frill development is better understood. Their parietals have seven points of spike growth, marked P1-P7, and these points of growth are called "loci" ("locus" singular). P1 is most often absent, but expresses as a ventrally-oriented spike that often overhangs the parietal fenestrae (it is most obvious in Centrosaurus). P2 expresses itself as a pair of small spikes which face each-other where the paired parietals would meet. In Centrosaurus brinkmani, P2 expresses as a cluster of small spikes that appear to cover P1. P3 is often the most obvious parietal spike in centrosaurines, almost always dominating the frill. In Styracosaurus albertensis, P3 is the first of three enormously elongate parietal spikes that give the genus such an impressive look. In Albertaceratops nemoi, P1 and P2 are completely absent while P3 has overtaken the frill, developing into enormously wide, flaring spikes which curve downward along their length. In Achelousaurus horneri, P3 forms a long, backswept and blunted spike that gives the frill a sort of "rabbit-eared" look. A sampling of centrosaurine frills. 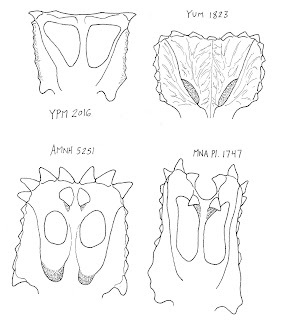 The two on the left are Centrosaurus apertus (top) and C. brinkmani. On the right is Achelousaurus horneri. 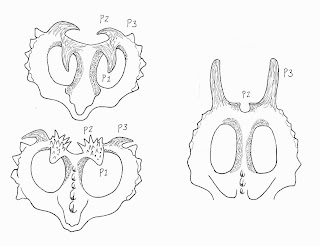 Note the absence in A. horneri of P1 and the wildly different forms taken by P2 and P3 in the two species of Centrosaurus. In most centrosaurine taxa, P4-P7 are either extremely reduced. In Styracosaurus, however, P4 and P5 develop into elongate parietal spikes just as in P3, though P4 is shorter than P3, and P5 is shorter still. P6 forms a small hook-like spine. P7 is small and inconsequential compared to the other parietal spikes. In Centrosaurus, Achelousaurus, Einiosaurus, and Pachyrhinosaurus, P4-P7 are barely worth mentioning. In Albertaceratops, P4-P7 are, oddly enough, fairly uniform in size and shape as pointed finger-like projections. A few centrosaurines further modified their parietals to support bumps and spikes on the parietal bar itself. This is most obvious in Pachyrhinosaurus lakustai, where at least one specimen (TMP 1988.55.187) preserves a trio of parietal spikes, though the most impressive truly massive central prominance. Albertaceratops has five small bumps running down the length of the parietal bar, as does Centrosaurus brinkmani. In the latter species, the bumps become larger proximally. In Achelousaurus, the proximal portion of the parietal bar is decorated by three small spikes, perhaps predicting the condition in Pachyrhinosaurus. 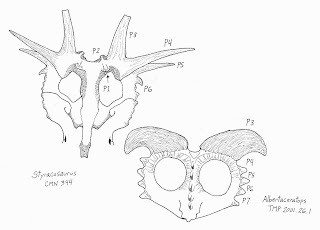 The frills of Styracosaurus albertensis (left) and Albertaceratops nesmoi. Note the differing structures of P3-P7 in both animals. Basal chasmosaurines may have initially followed a similar developmental path for the spikes of the parietal. However, given the different structure of the parietal itself, there was not as much room for spike loci. In Anchiceratops ornatus, spikes in locations analogous to P1-P5 are present. All are broad and roughly triangular, but there is no room for P6 or P7. "P5" is just above the contact between the parietal and squamosal. The situation is more dire for Pentaceratops, whose parietal is similar to that of Anchiceratops but even narrower--there is only room for "P1-P4." In Chasmosaurus belli, the dorsal edge of the parietal is almost totally devoid of spikes except for a two laterally-directed, triangular spikes acting as the "corners" of this ceratopsid's unusually triangular frill. In the most derived chasmosaurines (Torosaurus, Nedoceratops, and Triceratops, any sort of locus-like developmental process seems to have been completely lost, replaced by a smooth frill margin that is decorated by separate ossifications (epioccipitals). Most obviously apparent at an early age, the epioccipitals are quickly incorporated into the frill itself and tend to disappear in older animals. Given that every ceratopsid seems to have a different parietal outline, one would think (quite rightly) that such a structure would have important consequences for intraspecific signalling. I am reminded of the many species of deer and antelope that are, aside from their antlers and horns, amazingly similar in body form. It would also be interesting to see if sexual dimorphism plays a role in parietal development, though an enormous sample size would be necessary to investigate such a possibility. Of all the spikes and horns on a ceratopsian's head, those of the parietal frill are the most relevant from a phylogenetic perspective. I am impressed by the diversity in frill shape and form within this group of animals. 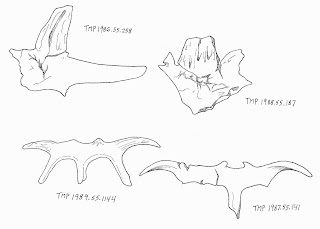 Selected parietal elements from Pachyrhinosaurus lakustai, including the dorsal section of the parietal (bottom two) and two examples of spikes on the parietal bar. Note that in terms of spikes on the parietal margin, Pachyrhinosaurus was fairly conservative, having retained only P2 and P3 with any kind of prominance. A note on parietal fenestrae. They refer to the holes in the frill that are common to almost all neoceratopsians. The exceptions seem to be Avaceratops (who is likely a chasmosaurine) and Triceratops. While the former has a truly solid frill (one wonders where the jaw muscles attached), Triceratops actually does not, despite claims to the contrary. While it does lack of parietal fenestrae, it still has small holes in the frill. What? It's a parietal fenestra if it is restricted to the parietal. Look at all of those pictures above: in almost all cases, the parietal fenestrae are totally within the parietal bone and are not formed by the border of the squamosal and parietal bones. Here's an analogy: tetanurine theropods have antoribital fenestrae and maxillary fenestrae. The former is formed by the borders of several bones including the maxilla, nasals, jugal, and frontals. The latter, however, is restricted entirely to the maxilla. It's like a hole in the maxilla bone. So parietal fenestrae are like holes in the parietal bone. But look at Triceratops: it has small holes in the skull formed by the border of the parietal (which flares outward proximally) and the squamosals. It has holes in its skull, but they are not parietal fenestrae! ...at least, that's how I understand it. "While the former has a truly solid frill (one wonders where the jaw muscles attached)"
at the top of the adductor chamber, wherever that is. I'd also throw the Lacrimal into the mix of antorbital fenestra forming bones. That said, theropod parietals are pathetic... though they certainly make up for it in other aspects of bad assetry. As alluded to by Nick, the "parietal fenestrae" you mention for Triceratops are "just" the dorsotemporal (supratemporal) fenestrae, the same as in every other ceratopsid (and indeed, pretty much every other diapsid). The confusion in appearance arises from the fact that the fenestrae are often (almost always) never completely prepped out. In these guys, the primary bones bordering the dorsotemporal fenestrae are the squamosals laterally, the parietals posteriorly and medially and also a little bit anteriorly. "...Avaceratops (who is likely a chasmosaurine)..."
Ignoring the brow horns and Triceratops-like lack of perietal fenestration, Avaceratops has classical centrosaurine features. For instance, the squamosal and premaxilla both clearly indicate a centrosaurine afilliation. And since we have forms like Albertaceratops and the soon to be named "last chance creek ceratopsian", and basal ceratopsids like Zuniceratops, a centrosaurine with brow horns is not unexpected. You should write a summary post regarding this series. Right on, I think I will. Thanks for the suggestion, brother. And the nomination!